Business VoIP features, an explanation of features that a business VoIP phone system needs. Business VoIP services including hosted VoIP (or sometimes called a centrex service) have become increasingly popular and are an excellent choice for your next business phone system. Business VoIP accounts usually have a feature list that includes typical residential features plus possibly additional business type features. One big item that a hosted PBX VoIP service would have are extensions or extension dialing, and attendant and other traditional PBX features. These business VoIP features are so robust that they can make the one man business "big" with an affordable phone "system" for a low monthly charge. Looking at a description of features and how that might be used in a business environment can show the true advantages of VoIP. Here are a list and explanation of business VoIP features. Attendant - The attendant or sometimes referred to as the virtual assistant initially answers incoming calls with a custom greeting. From there callers can choose options for departments, extensions or even prerecorded messages depending on how you choose to customize it for your business. It eliminates the need for a receptionist and makes even the smallest business big. Extensions - Having multiple extensions allows calls to be routed to people, message extensions, or even mailbox only extensions. Virtual extensions are extensions that may not have a physical endpoint or phone connected to them but do take calls, like a message extension where callers get to listen to specialized pre-recorded messages and no one actually answers the call. Calls between extensions, even remote locations are typically free saving call charges for many businesses. Follow Me - Also sometimes called Find me - Follow me, a phone call uses a list of numbers to try so that you never miss a call. Some VoIP systems are becoming so sophisticated that when your at your office desk the calls will automatically go there and when you leave will go to your cell phone without you having to do anything. Inbound Faxing - Faxes can be received by the hosted PBX system and then sent to the user via email, usually as a PDF attachment. The server detects the inbound fax and will automatically know it is a fax. Your phone number also becomes your fax number. Call Recording - Recording a call can be accomplished by the click of a mouse, eliminating the need to have to set up something prior to the need. Once recorded these messages are stored with specific details for later retrieval. Music or Message on Hold - MOH offers the professionalism that most businesses strive for. Using a professional service for recordings can make your messages stand out and deliver new business. Conference - Built in conference features allow users to join in on a conference call any time without the hassle of having to make specific arrangements in advance. Whether you want 3, 4 or more callers all together, it's easy with an included conference. Call Scheduling - Sometimes referred to as time based routing, call scheduling allows you to set specific call routing rules for certain times, whether that is weekends, nights or holidays. Call Queue - Allowing calls to wait for an available agent, a call queue is a like a phone waiting room. Announcements can usually be set to tell a caller their position or wait time. Administration Control Panel - A web based interface where your system can be configured, user and account information administered, and call detail logs be viewed. A control panel that is intuitive and user friendly goes a long way in making a complete system usable and a good bargain. Recently a real estate company announced that they designed and built a center where agents could hold meetings in reserved offices and use the atrium like premise as a place to work with wireless access on a come and go basis. No longer needed were cubicles or assigned desks. Business was now being done totally different than just a few years ago. We truly are working "in the cloud". A real estate agent working wirelessly, receiving PDFs of their faxed documents, talking with an important client, all while another prospect is listening to a pre-recorded message about a listing, by calling the agent's own toll free number and putting in an extension number. Wow, that's big business. 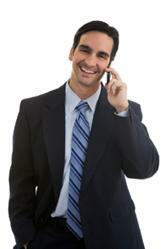 Business VoIP service is helping business people make more deals and have a bigger presence. Business phone solutions are all about hosted VoIP.